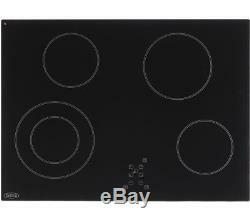 BELLING CH70TX Electric Ceramic Hob - Black. Kitchen Appliances > Built-in Appliances > Built-in Electric hobs. Brand new & pristine product. Top features: - Plenty of functions to meet your cooking needs - Safety features provide peace of mind Plenty of functions With 4 cooking zones, the Fastlite elements have much faster heat response than standard ceramic elements. The Belling CH70TX Electric Ceramic Hob also features Power Boost for an extra bit of heat when you need it perfect for stir-frying. The smart hob also has a keep warm function and a griddle zone for total flexibility in your hob cooking. Safety features With safety in mind, the Belling CH70TX has a child lock on the hob as well as a hot hob indicator where a light stays illuminated whilst the hob is hot. The hob also features a handy auto switch-off function. _______________________________________________ ELECTRICAL INSTALLATION: This product requires professional installation to a dedicated cooker circuit (identified by a big red cooker switch) by a qualified installer, such as one of our Team Knowhow experts. All Currys/PC World Outlet guarantees are non-transferable. Hob power: Dual Ceramic 2.2kW, Small Ceramic 1.2kW, Medium Ceramic 1.8kW, Small Ceramic 1.2kW. Safety features: Hot hob indicators, Child lock. Other features: Power boost function. Installation: Please note this product needs to be installed by a qualified engineer, such as one of our Knowhow experts. Minimum distance required / Minimum clearance above hob: 650 mm. Box contents: Belling CH70TX Electric Ceramic Hob. Dimensions: 45 x 690 x 520 mm (H x W x D). Recess dimensions: 660 x 490 mm (W x D). Boxed dimensions: 130 x 740 x 560 mm (H x W x D). Boxed weight: 8.4 kg. This product has no reviews yet, however see what our buyers say about our other products..
Where can I return a product? Following The Consumer Contracts (Information, Cancellation and Additional Charges) Regulations, we will accept items back even if you have opened the goods to inspect them. Whilst the goods are in your possession you must take reasonable care of them. Orders for large domestic appliances are accepted to all mainland UK addresses (including Northern Ireland) and the following islands: Isle of Skye, Isle of Sheppey, Anglesey, the Isle of Wight, and the Isle of Man. This excludes the Channel Islands and BFPO. Unopened - in an as new condition - unused, without installation or data input - in the same condition as supplied to you - complete with any accessories and free gifts offered with it - with the original box and unopened packaging. Unwanted products cannot be accepted after 30 days if any of the above criteria are not met. The right of cancellation does not apply in the following circumstances. When the product seal has been broken on any DVDs, CDs, memory cards or software, including games - On any personal hygiene products such as shavers, hair care products - On headphones, where the seal on the packaging is broken - If you want to return a Software Product Activation Key card which is not faulty, the silver strip on the back of the card must be fully intact as new. In the same condition as supplied to you - complete with any accessories and free gifts offered with it - if possible, with the original box and packaging. The above warranties do not cover non-faulty products, nor issues caused by accident, neglect, misuse or normal wear and tear. Please note - we do not stock spare parts, and are unable to send replacement parts. You received an incorrect item - you received a damaged item - you received a faulty item. Can a Currys or PC World retail store help? Reassuring 12 month guarantee on all products. The item "BELLING CH70TX Electric Ceramic Hob Black" is in sale since Monday, August 14, 2017. This item is in the category "Home, Furniture & DIY\Appliances\Cookers, Ovens & Hobs\Hobs". The seller is "currys_pcworld" and is located in Newark.